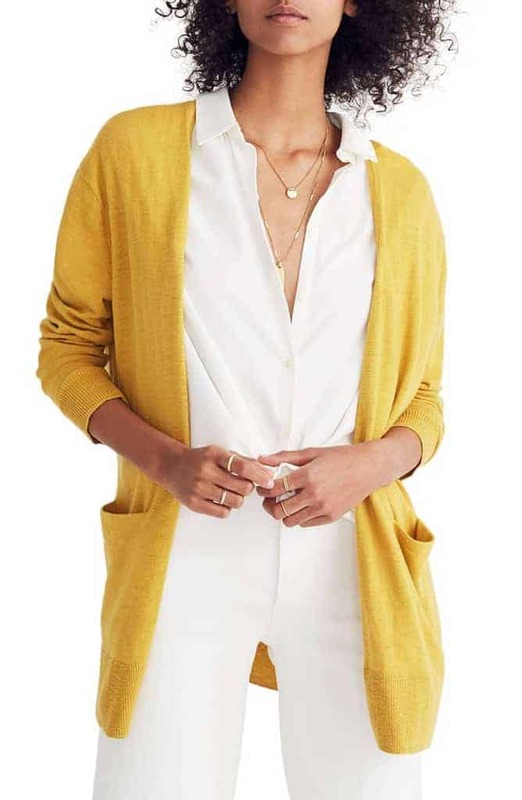 If you want a little bit of extra coverage, or are looking for another layer to battle cold air conditioning there are lots of beautiful, lightweight cardigans to make your summer a little bit more comfortable. Open front sweaters are a great wardrobe staple that goes well with summer dresses, jeans, or a pair of nice dress pants. Whether you are looking for long, mid length, or cropped styles, we have found some of the most comfortable, office appropriate, and pretty cardigans that will help you dress for the weather, whatever it may be. Loft is a great store to get cardigans, especially if you want a style for a work environment. 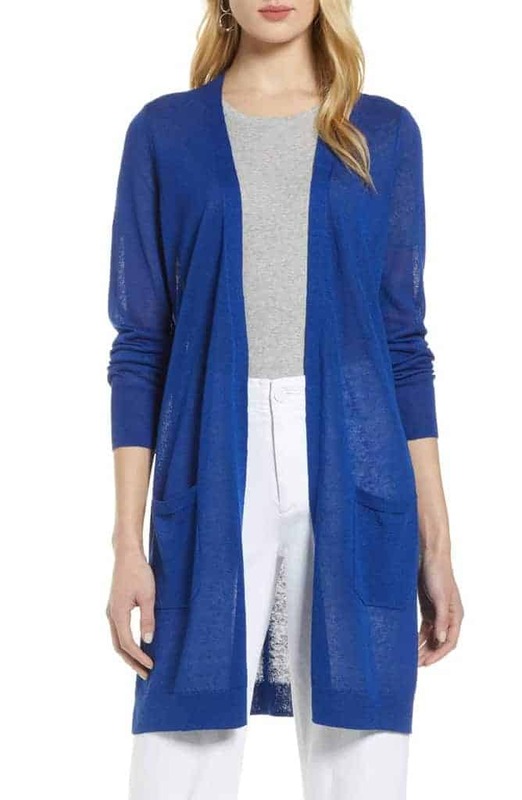 A favorite summer cardigan for many women is this sheer open sweater that they bring back every spring. It is lightweight with long sleeves and an open front (so no buttons). It is a little sheer which is what some women love for the warmer months, as it gives coverage but is still cool when you are out in the heat. This style probably isn’t what you want if you are looking for a design for a heavily air-conditioned office, although they are dressy enough to be appropriate for work attire. It comes in a variety of pretty colors and is machine washable. Another great thing about this sheer style is the length, and it is just long enough to make it quite versatile with most outfits. A slightly longer sheer option is the Halogen® Long Linen Blend Cardigan. As you can see from the picture, it is quite long at around 35 inches, which for most women will fall mid-thigh. The fabric is a fine-gauge knit spun from linen-blend yarns that are reportedly very soft and comfy to wear. One cool feature is that it has pockets, pockets can be a bit tricky to pull off on a sheer fabric but, by most accounts, this Halogen style seems to do it well. The fine-gauge knit is quite delicate, so you will have to be a little bit gentle with this style while you are wearing it and also when cleaning. It comes in a range of pretty colors that are perfect for spring and summer that can easily be worn with work pants and a blouse, or with jeans. The only issue you should be aware of with this style is that the darker colors can transfer to lighter color clothes that you may be wearing. Banana Republic is a reliable place to get classic cardigans year after year. This season (spring 2019) they have a wide range of lightweight options. My favorite is the stretch-cotton cardigan, which they do versions of every year, this year they have included some bold color options to liven things up a bit for spring. The slightly cropped design makes it a perfect style to wear over a dress on a summer evening when you want a little bit of warmth, you can also buy the matching shell, so you have a cute little option for work. They are classic, comfortable to wear and look surprisingly good. The other great thing about the stretch-cotton style is that it washes well. Often cotton sweaters fade a bit when washed, but somehow this style maintains its color and shape through multiple washing and still looks great. BR also has a beautiful silk cotton duster that is very long (since it is a duster), super soft, and very stylish, especially for the office. A great spring wardrobe addition is the Talbots Kelly sweater. You can buy the matching shell for a classic sweater-set look, or get the cardi by itself. While it isn’t full sleeved, the elbow length sleeves manage to give you an excellent level of warmth for the office without being overpowering. It comes in some pretty vibrant colors that will freshen up your wardrobe nicely. The fabric is a cotton blend of 60% cotton and 40% rayon, so it is breathable with some stretch. Madewell is a good brand for finding cozy sweaters, especially their big and bulky designs for keeping warm while still looking stylish in the winter. If you are a fan of Madewell, you may want to check out the Summer Ryder Cardigan. It is similar to their bestselling Kent cardi that is a popular style for fall and winter, but Madewell makes the Ryder with a lighter knit of a cotton blend of 80% cotton, 20% nylon so you can wear it in the summer. The length is 29 inches so it is enough to cover your behind but won’t go too far down towards your knees. It is open front, so there are no buttons to do up. Some of the colors that it comes in are a little bold, but you can also get it in a more muted grey or ivory. A lot of women feel like this is the perfect lightweight summer evening sweater and is a great go-to for all kinds of situations. On some women, it can look a little boxy, so if you like a more fitted style then the Summer Ryder is probably best avoided, but if you love a loose-fitting style this could be a great design for you. 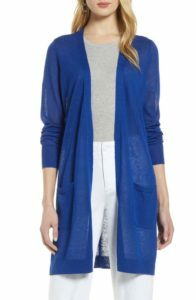 The NIC+ZOE 4-Way Lightweight Cardigan is a fun design that you can wear four different ways (open, crisscrossed, tied at the front – either midsection or at the hem). This super versatile design is a mélange-knit cardigan that is 60% linen and 40% viscose. The length is only about 27 ” at the front so that it won’t go past your hips for coverage. The sleeves are 3/4 length, which is a nice length for warmer months. Women who own this sweater seem to love it. The brand is known for its comfortable style, and high quality of the clothes and this particular design is a favorite due to the versatility of the different ways that you can wear it that all look attractive. A lot of women mention that this style is a perfect option if you don’t like showing your arms in the summer, as it gives good coverage, but it is lightweight enough to be comfortable in warmer settings. 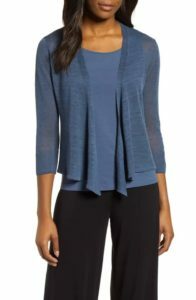 Ann Taylor is a fantastic store to get outstanding quality, nice clothes for the office, so it isn’t a surprise that they have one of the best lightweight sweaters going with the Ann Cardigan. It comes in a beautiful soft knit of 55% cotton, 25% modal, and 20% polyester. The cotton makes it breathable, the modal makes it smooth, and the polyester makes it durable. It is another style that comes in very vibrant colors, with the green (pictured above) being a particular favorite for a lot of women. It is button up with ribbed cuffs and hem, and the length is only 23 ” long, so for most women, it will sit just above the hip. You can get the Ann in lots of beautiful colors that will work well with dress pants and skirts. Overall it is a soft, stylish staple that is easy to wash, and not too light or too heavy for the warmer months. 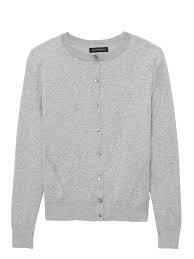 One excellent option that J Crew offer that is good for the spring or summer is the Featherweight Cashmere Cardigan Sweater. As you probably know cashmere is usually super soft and very warm. This style is a different take on cashmere as it is featherweight, so it is light enough for the summer, and it is super soft to boot. Since it is lightweight, some of the colors are somewhat sheer, so it works well for a spring or summer evening, but won’t keep you warm in the winter. It is a delicate fabric, so you will have to wear this design with a bit of care. The fit is similar to the cotton Jackie sweater, but with long sleeves rather than the 3/4 sleeves. On most women, these J Crew styles are quite a flattering fit, which is what makes them such a favorite and brings them back year after year. You can wear this sweater with high-waisted skirts, pants, jeans or sleeveless dress or blouses.